Quite a few of you commented on how nice our blue quilt is (see previous post). I've blogged about this before but we must have a lot of new readers here, so let me explain the blue quilt again. I bought the blue quilt at Ikea a few years ago when I needed a bed covering that hung down to the floor on both sides of our bed. In winter, we have a top flannel sheet and a doona/duvet but they only hang to the bottom of the mattress. To be really cosy in a winter's night, we need a longer top covering. The blue quilt is ideal, running from floor to floor over the top of the mattress. But not to disappoint the quilters out there, I found the first quilt I ever made. I've only made two full quilts and this is the first one; the second was Shane and Sarndra's wedding quilt. I made this little single quilt in 1980 when Shane was a tiny baby. A year later I had two tiny babies when Kerry was born 12 months after Shane. I needed a cover to put on the floor so I could put both of them down. As they grew, we used the quilt as a play mat, a tent and a hide away and any number of other things. I think we even used it as a quilt for a while. I haven't seen the quilt for years but found it again this week when I cleaned out the linen press. There it was in all its unpretentious glory, lurking at the back of the cupboard. As you can see in the photos, the quilt has been well and truly used and it's been washed many times. I don't remember much about its construction, only that in the late 1970s, I bought a bag of pre-cut Laura Ashley patchwork squares and set about sewing them together when Shane was sleeping. The backing is an old brown sheet and all the stitching is done on the machine. It's not made well, it's very simple but it holds a lot of memories for me. 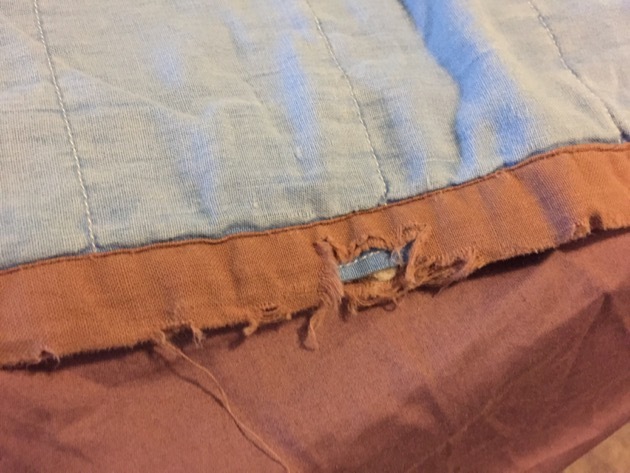 It's in need of repair now with one of the squares frayed and unstitched and all along the edge, signs of wear and age need some sympathetic hand sewing. I'm not going to replace or hide any ageing fabric, the wear is part of the quilt now and I want to keep that, but I will tidy it up and repair the obvious. This is the Around the World wedding quilt I made for Shane and Sarndra. Tricia helped me piece it together and my DIL Cathy did the machine quilting. When the quilt has been repaired, I'll return it to its former productive role and use it to protect my off white lounge from the grandkids. I like to use everything I have. Everything I own now has to work for its keep. It should have another 10 years of life left in it, I think I do too, so as soon as it's repaired, I'll put it to work on the lounge and it will be part of my daily life again. Do you have any of your old handmade quilts still doing service in your home? That is great! I still have my first "quilt". It was tied, not even really quilted, but I still love it. It's in only slightly better condition than yours. Also, I second what you said about items earning their keep. I'm sure there are more happy memories to be made with that quilt. Enjoy. My daughter still has her baby quilt which is used as a knee rug on cold nights. The first time I saw photos of your quilt on your bed I remember thinking how cosy it looked, and that all those staged photos of beds with new doonas and too many pillows were not so aspirational after all. The first quilt I ever made I gave to and actually made it for, a new baby in the family. That was about three ears ago now,; he did not receive it until he was almost a year old. It took me that long! But I hope he still enjoys it. Perhaps he will have it as long as you have had yours. Quilts have a special place in my heart. My nanna was always a massive crafter, had a go at the lot id say, a few years before she died she started making quilts for herself and to give as gifts. My mum and aunties all received one and then she offered to make me (her only granddaughter) one for my birthday. I still remember going to the craft shop to pick out my pattern and a few fabrics I liked. Unfortunately she didn't get to finish it and enlisted a family friend to complete it for me. (On her last few days when she was in hospital she asked her, my pa said it was one of the last few things she said 'make sure Jeanette finishes Brookie's quilt') She was about 75% through and needless to say when it was handed over to me a few months later it was an emotional moment. It now sits on my spare bed and it brings back happy memories and love when I look at it. Its the one thing apart from a few photos and people/pets I would grab if my house was on fire, haha. I have quilts that my great grandmother and my grandmother made long before I was born. I have two quilts my husband's grandmother and her mother pieced and quilted, but were never bound. Found in the back of a cupboard almost ten years ago now, they were given to me ( I'm the only quilter in three generations of both families) and I did the binding. All five of these quilts hang on various walls in our home because I want my grandchildren to see and appreciate the workmanship, handed down over many years. They are beautiful quilts, with many small pieces and tiny stitches. No handmade quilts here but plenty of handmade crocheted blankets for each bed, in a thick, single crochet stitch that makes for a very heavy blanket. There is nothing warmer in winter and that allows us to leave our heat off at night. Your Around the World quilt is just beautiful! I knew as soon as I saw it that it was Laura Ashley- she made some very distinctive designs at that time, and the fabric was really nice. I have some similar hexagons, some made up in a small quilt and some still waiting to be used. One of my projects for this year I think! I remember these Laura Ashley fabrics, my mum had some. Thanks for sharing, brought back memories. How lovely finding your first quilt you made for your boys. I wonder if they will remember it when they visit? What a beautiful wedding quilt you made the colours are so pretty together. We don't have any quilts but we have two crochet granny blankets that were made by my mother. When she passed there were enough blankets for my three sisters and I to have a couple each. We all treasure them. I love the quilt you made for Shane and Sarndra. Out of curiosity, since you gave it to them as a wedding gift, how did you end up getting it back? I didn't get it back, Cate. It's still on their bed. The photo I used here was taken before I gave it to them when Tricia and I put it on my bed to see what it looked like after the machine quilting was finished. I have a quilt my grandmother made me for my university graduation. I use it every year; it's my go-to quilt. It's getting a bit worn, but it's still lovely and useable. quilts are so homely, aren't they? & some have some wonderful history attached to them too. 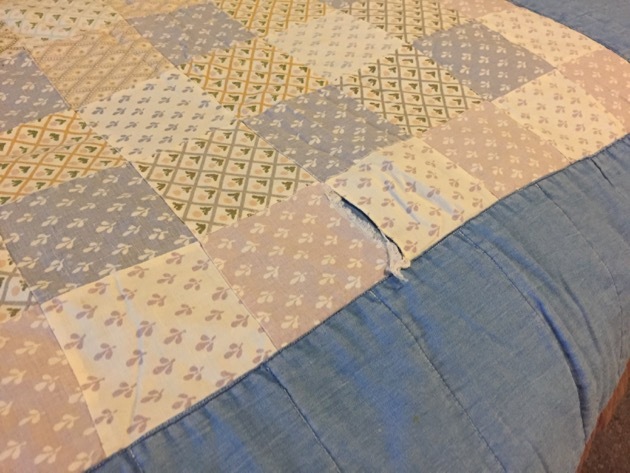 i've only ever bought the odd 'quilt' when some were cheap at copperart when the kids were little, for their single beds, they are all in need of some repairs now, i don't want to waste them. I have the first quilt I made from fabric given to me by my MIL when she was a curtain maker. 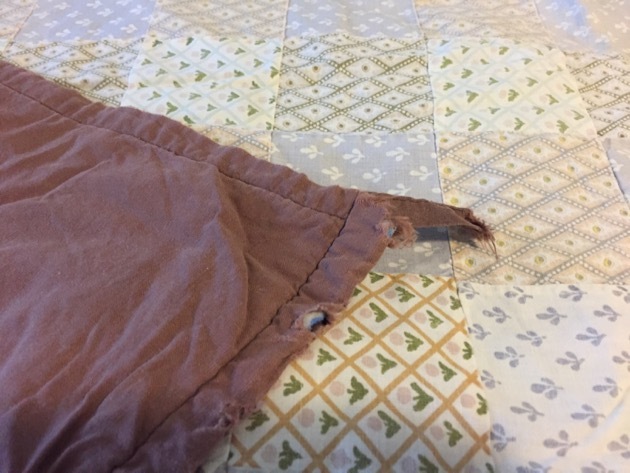 Now after nearly 20 years some of the fabrics have frayed ( of course) and I looked at it and thought to myself," back in the pioneering days women would not have made a whole new quilt, they would have patched the quilt they had". So that is what I have done. I made new "blocks" for the sizes I needed and then I handsewed them on top. My quilt is patchwork so unless you look really carefully you would not even notice the repairs. I like that you" use everything you have"; making it earn its keep. Now a Grammie myself, I also like hearing things such as "Mimi, everything you have used to be Real in your house. Right?" Lovely words to my ears. They appreciate the value of older things and also realize that tattered looks only improve things when they are Real......as in "The Velveteen Rabbit" by Margery Williams. Rhonda, what a lovely story of the quilts in your home. I made my daughter's cot quilt to match all the other nursery items I sewed, when my daughter moved to a bed I sold the whole set after someone offered to buy it. I lost my grandmothers (who died before i was born) quilt that she brought over from Scotland in a fire (along with everything else I owned). A few months later I won a quilt in an op shop Christmas raffle. I cried when the lady rang to tell me I had win the quilt. A friend also made me a quilt as a house warming present for my new (post fire) house. I cried then too. I have a patchwork duvet cover, from the same era using many of the same fabrics, although mine was random as it was made from some ready cut aquares but also a couple of Laura Ashley bags of scrap pieces. It has moved with me to my new house and sits in my airing cupboard waiting for me to turn it into a proper quilt. Beautiful fabric. Quilting is on my list of skills I want to learn, but must master sewing first! I do have an old crocheted afghan my Amma made me when I was a kid, and also a tied fleece blanket my aunt made me when I went off to college. They match nothing in my home, but they live on the quilt rack in the living room where I can easily grab one to snuggle into when the leather furniture is too chilly or I just want something to wrap around me, and seeing them there makes me happy. I love the idea of quilts actually being used. I see a lot of people who make (or purchase) elaborate quilts that hang on the wall as art--nothing wrong with that, but I'd be afraid to actually use such a quilt. Something simple seems less intimidating, if that makes sense. Oh no, why is the forum closing!? I'm sure there is a good reason but I'm curious and didn't know where to ask. I am the first person in our family to have ever made a quilt but i hope they do the rounds for many years to come. I do still have my first quilt! I made it for my Year 10 Textiles and Design Project back in 1993. That doesn't seem like so long ago to me, but actually, it's almost 25 years! As a great time traveller once said, "Great Scott!" This quilt doesn't come out very often as the colours are no longer to my taste (pastel pink and blue, with purple stripes!) but I do pull it out for camping and sleepovers with the kids. 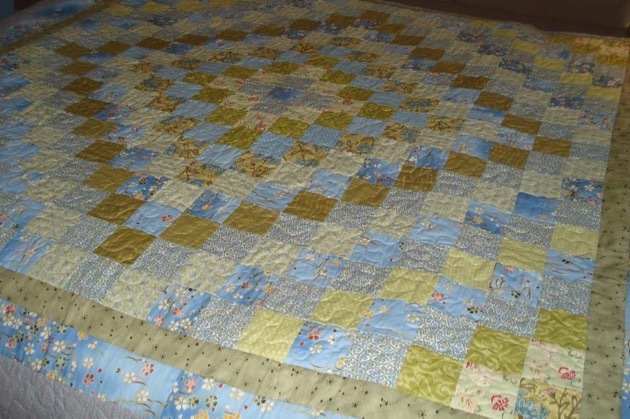 In recent years I have made many quilts, mostly for babies that continue to come along in our family. I have a new one sitting here on my shelf, waiting for the small niece who is yet to be born. I love to anticipate this moment and run my hands over the quilt, just waiting. 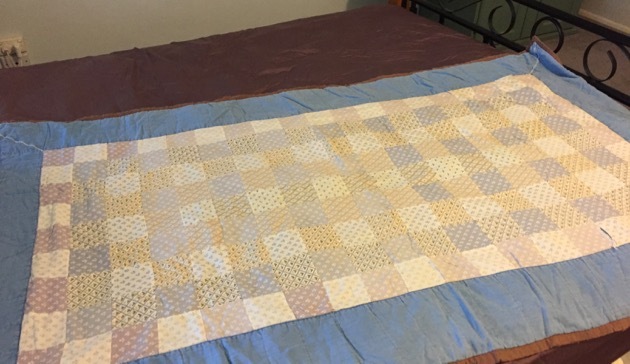 The original quilt i made 22 years ago is still in service and was made from curtaining fabric left over from my MIL curtain making business and i backed it with a sheet. I did patchwork and like other quilts i have made since i did not quilt it but knotted it through all 3 layers tying it off on the bottom. It has kept the quilt together ( I did the knotting in formation and it was nice a tidy on the back) The last couple of year i have had some of the rectangles begin to perish so i thought to myself" i am sure the pioneer ladies would not have rushed and made new quilts nor have the fabric to do so, so they would have mended them" so i cut out 3" squares and then edged them with another fabric 1" round all sides and then hand sewed it on the area that needed to be mended and when one looks at the quilt it really in not noticeable as the quilt is of many colours. I am happy with how i have made sure it will last many more years.